We held a Survivors Kick out the Killers mini camp in Dallas, Texas and it was a great success. This camp was hosted at a Catholic School and organized by my dear friend and prolife warrior, Sue Cyr. We at Survivors believe this is a model we can take to any city we are asked to come to. I wasn’t sure we could get the transformation we desired in so short of space because we are a lead-by-example organization. Getting sufficient training and enough on the street activism was our top priority. We tightened up the training and began light activism within a day. It turned out great and definitely something that we can continue to do as we are invited to cities across the country to activate the youth. Read Sue’s report below! It’s easy to fall off the saddle. I was raised in an active pro-life family, and have done many years of pro-life work. And yet it’s easy to get distracted with family, church, and helping others around me. Sometimes we can forget that babies are actually dying every day. . . that abortion continues to be legal in our country! Here in Dallas, about 50 babies are killed every day. 50 . . . 50 . . . 50 . . . 50 . . . 50 . . . 50 . . . babies being killed, and moms hurt. That means we need to stay focused to help end abortion, so the killing will end . . . not just in Dallas, but in our whole nation, and God-willing, the world. I’m so very thankful the Survivors’ team came to Dallas for an amazing 5-day mini-camp during Spring Break. We gathered 39 youth for the camp, and most of them hadn’t done any pro-life activism before. They are a very sweet group of kids, from great families, and willing to be used by God. The most fun part for me was watching these kids go from “willing” to “doing”. Each day, they went from sitting in chairs during the training talks, and watching movies about how to peacefully end societal evils -- to being out on the frontlines making an impact in Dallas and Fort Worth. Since the focus of Survivors is to actively train the youth to end abortion, our campers did activism specifically designed to make abortion unthinkable and uncomfortable. We picketed abortionists at their homes and other business offices with graphic abortion-victim signs. We showed fetal-development displays and gave handouts in the popular downtown Klyde Warren Park. Several campers were willing to take the bullhorn to share the pro-life truth to those walking by. 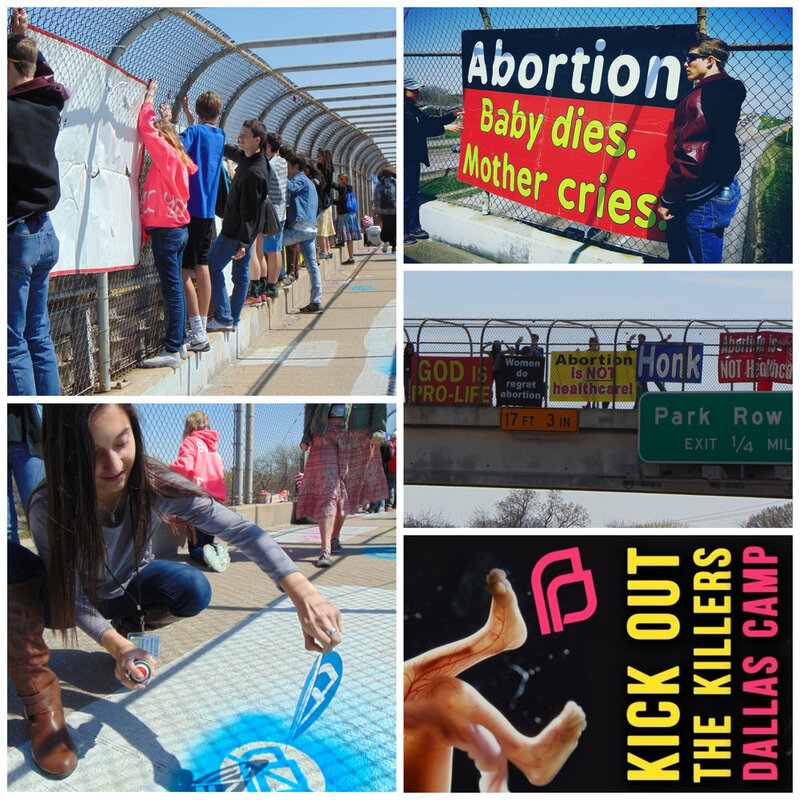 The campers enjoyed doing Operation Overpass with pro-life banners above a freeway, chalking pro-life messages on sidewalks, doing the Memorial Die-In with red cloth, using the neon Light Up Boards at night saying "Planned Parenthood Kills Babies", and the Nighttime Projection of pro-life messages on a building next to Planned Parenthood. Many of them, even shy kids, were excited to be trained to speak with the police who might show up at our events. And it was fun to see different campers take the role of Event Leader and direct all the other campers what to do, where to stand, and to then close the event in prayer. My two sons enjoyed the camp and took turns as Event Leader, Police Liaison, photographer, and more. The campers were very moved when we visited the Calvary Hill Cemetery where 1,500 aborted babies are buried, and heard from pro-lifer Laura Weston about how she found the babies in the dumpsters behind abortion clinics, how she cleaned up their little bodies, and worked to give them a proper burial -- now at this cemetery site that has a memorial service each year. As the camp pressed forward, the kids were so excited to be making an impact. And I was so excited to be reaching out to many pro-lifers from years gone by, and making contact to work with current pro-life activists and leaders. Lots of connections were made and with God’s grace, will continue to produce fruit in ending abortion. The camp was a team effort and came together with moms providing meals, donors providing plane tickets and hotel rooms, several sacrificial pro-lifers traveling across the country to help make the camp happen, and national pro-life strategists coming to speak to the campers. If you want to generate pro-life activism in your city, sponsoring a mini-camp is a great way to call the youth together, muster resources, and go out to proclaim God’s desire for love and protection for the unborn. The campers are now saying, “Let’s do more activism in Dallas”, and “I really want to go to the summer camp in California.” Five of the campers already helped me at an event just five days after camp ended. And a reminder for us all: one of the young campers said the only thing she would change about camp is for us to “pray more”, so we can be even more prepared for the battle. I agree, and love that wisdom from this leader who will be taking the reins from us. At the end of the camp I felt so thankful. I felt blessed to see these campers transformed into doing passionate activism in such a beautiful way in just 5 days. I’m very blessed to be back in the saddle. Albuquerque, NM- Abortion Free New Mexico received confirmation from the New Mexico Medical Board (NMMB) that they have launched an investigation into the death of a local Albuquerque woman who died on February 4, 2017 as a result of complications suffered during a late term abortion performed by Curtis Boyd. “[The] New Mexico Medical Board received your complaint against Curtis Boyd, M.D. on 12/18/2017, and was forwarded to the Executive Committee for their review and determination on whether or not a formal investigation is warranted.